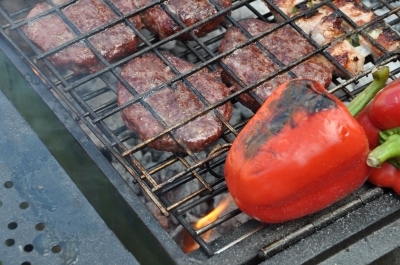 As barbeques are usually stored outdoors, they will be constantly fighting the elements if not under some form of cover. Protection form heat, rain, frost and insects/animals is vital if you want a barbeque that is going to last its full term and always deliver you flavoursome food. Large stores such as BBQ Galore stock plenty of barbeque maintenance products including covers that will suit whatever size and shape grill you have. Click here to see an example of a triple or twin grill barbeque cover from Ziegler & Brown. It might be a natural instinct to clean up after you’ve cooked, but it actually isn’t a bad thing to not clean your barbeque after using it. This is because the blackened cooking will help to protect your barbeque from things like rust. The best time to clean is just before using it again. Fire it up first, as the heat will help to loosen what’s stuck there, and start scraping away. Cleaning just before use is also a great option because you know your food is definitely going onto a fresh grill. Making sure to empty the ash plate regularly is also important. It might be an unusual notion, but there is such a thing as cleaning your barbeque too much. Cleaning the grill plate is vital because you want your food cooking on a clean surface, but don’t go overboard on cleaning the inside of your barbeque as well. Wipe it down to remove any chunky food items or stray ash, but leave the inside of your grill looking ‘dirty.’ Doing this will season the inside of your barbeque, making your food even tastier. To help maintain the cleanliness of your barbeque and stop the sticky mess building up on your grill plate, use oil. Using oil will also stop your food from sticking and burning too quickly when you’re cooking. Plus, oil will add that extra barbeque flavour! Heating with a little bit of oil rubbed along the grill can also assist when cleaning. Once lacquered, get the grime off using a grill brush with tough bristles and a decent length handle to avoid the heat. Your barbeque is responsible for cooking you beautiful meals and acting as a focal point for social gatherings, so it’s important to treat your grill with the respect it deserves. With proper maintenance and cleaning, your barbeque will be around for the long term, continuing to impress and spoil you with great food! What are some of your best barbeque maintenance tricks? Comment below.